Torchiere floor lamps and halogen torchiere lamps are a great addition to any décor where existing overhead lighting is insufficient and a more indirect light is desired. You can even get torchiere table lamps or other matching table lamps, floor lamps, or mini pendant lighting fixtures to complement your inexpensive halogen torchiere lamps. 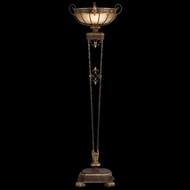 Please click on a torchiere lamp from our selection below for more detail. Halogen floor lamps and fixtures can be yours for a great price when you buy halogen torchiere lamps from AffordableLamps.com. We have an excellent collection of halogen torchiere lamp for sale and the eclectic selection of affordable halogen floor lamps and other torchiere lamps that makes it easy to find what you are looking for. Indirect halogen lighting is pleasant, unobtrusive, and cozy, and torchiere floor lamps light up your home or office atmosphere without the need of installing overhead lighting fixtures. In fact, the best torchiere table lamps and floor lamps, halogen fixtures or not, can provide as much light as direct overhead lighting. A decorative glass or metal reflector bowl provides the indirect illumination within the torchiere lamps' upper housing, bouncing the light off the ceiling and allowing the halogen torchiere lamp to illumine the entire room. Affordable torchiere table lamps, halogen floor lamps, and other halogen torchiere products are also ideal for rental apartments and college dorm rooms where room modifications are not allowed. Affordable torchiere lamps can be placed in these rooms inexpensively and will provide all the light students and renters need. Certain torchiere floor lamps cast indirect light, as well by way of a down-light or side swing torchiere lamp arm module.